Tremble before the mighty Smoking Spaceman. 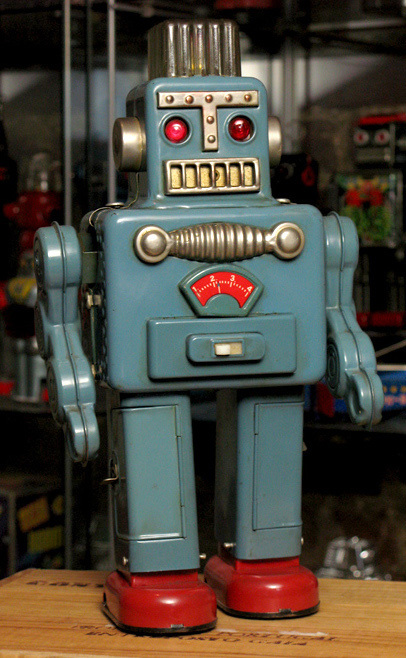 Twelve imposing inches of tin, this toy robot walks forward with light-up eyes and an illuminated color wheel that rotates under his dome. But what really sets him apart, what prevents this toy from ever being manufactured today, is the smoke that puffs from his mouth whenever he pauses in his stride. The mechanism that causes the whispy little clouds consists of a small, heated wire that makes contact with a bit of cotton doused in oil. Take that, pesky Safety Commission! This rare, blue version of the Smoking Spaceman was released by a Japanese company called Yonezawa in 1961. It also came in an even rarer mint green. A much more common metallic grey version of the toy, which features a metal on/off switch and other small design tweaks, appeared in 1960 under the Linemar brand. This particular robot is one of my favorites, and I waited a long time before even having a chance to add him to my collection. I love the colors, I love the wonderful, iconic, mid-century design that screams "classic science fiction." This is the kind of robot that any city would be honored to get stomped on by. Thankfully, it's only a foot high and doesn't have much chance of wrecking my toy room. I consider myself lucky to own a Smoking Spaceman -- especially a blue one. Especially this blue one. I won it at the Robert Lesser auction last year, and to own a toy with that sort of provenance is just a thrill. I'll talk about Bob Lesser some other time; for now, trust me when I say that he's one of this hobby's original gangsters. Bob was collecting back in the day when people considered these toys nothing more than shiny pieces of junk. He recognized the toys' inherent artistry; more importantly, he thought they were fun. He built up an amazing collection full of all the best toys, including the blue Smoking Spaceman. I've admired Bob's taste and vision for a long time, and when he finally put his toys up for auction, I decided that I wouldn't settle for just any ol' piece. I wanted to take home something that was not only at the top of my wish list, but also one that really represented the spirit of Bob's collection. 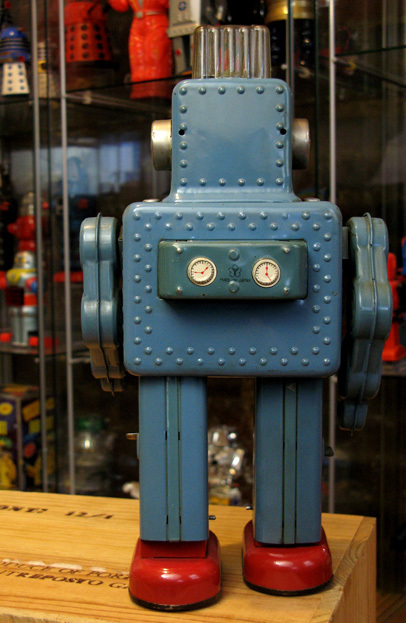 One that positively screamed "vintage tin toy robot." The Smoking Spaceman was it. But therein sat the problem. The Smoking Spaceman is, at the best of times, a popular robot -- I'm not the only collector with a good eye! Even the more common grey one, which appears on eBay every couple months, can snag a pretty penny when it's in good condition. If it's boxed, prepare to dig even deeper into your wallet. The blue and green versions... Well, let's just say that they attract the big-time collectors like a spinster aunt attracts cats. If you want one, you might as well figure out which body part you can sell in order to raise the cash. Now, I'm not a big-time collector, and I sure as heck don't have any extra body parts lying around. So I started saving my money months before the auction. But I knew I needed an edge, and I hoped that some inside information might sharpen my chances. See, the auction listing in the catalog said that this Smoking Spaceman had some paint touch-up inside the battery compartments, which are located in the legs. It also mentioned some touch ups to the outside of the legs and on the robot's shoulders. This is exactly the kind of thing that turns those high-end collectors off of a toy. See, they've got money to spare, and their feeling is that, if they're going to spend piles of cash on a toy, they want that toy to be mint. If not, they'd rather just wait. But here's the good bit. The good bit is that I'd already taken a close look at this particular toy. It's one of my all-time favorites, so when I visited Bob's house, I gave it a thorough once over. When I went to a display of Bob's toys at the Museum of Science and Industry in Chicago, I gave it a thorough once over. And when I went to the auction preview, I gave it yet another, even more thorough once-over. And sure, okay, I had to listen to Bob scream at me to stop drooling on his toys, but it was worth it -- I knew for a fact that despite what the catalog might say, any touch up on this robot wasn't that big a deal. In fact, if no one had told me, it's a good chance I'd have assumed any such touch ups came from the factory. So armed with my super, secret information, I was cautiously optimistic that the catalog description might turn off potential buyers, leaving me to swoop in and grab a toy that I knew was pretty darn close to perfect. And guess what? That's exactly what happened. On the night of the auction -- actually, the next morning, but that's a story for a different blog post -- I emerged from a fierce battle against... one other bidder. Who only threw in one half-hearted bid, leaving me as the last man standing and the owner of my very own blue Smoking Spaceman. The moral of this story? Never assume that a toy is beyond your reach. Too rare, too expensive, too popular -- dookie! Keep your eyes peeled, do your research, save up some emergency cash, and be patient. 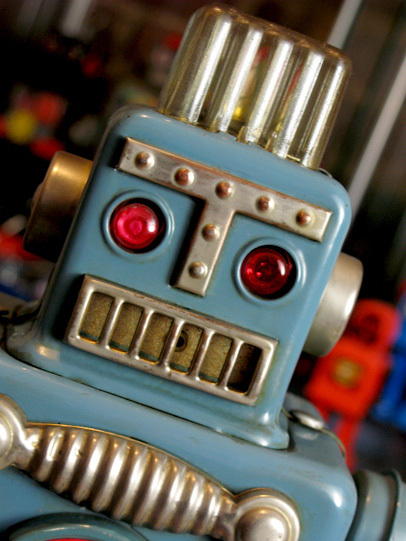 The right toy will come along and you'll add that dream robot to your shelf. It's happened to me twice... but that's another story about another robot for another time. Note the "Y" logo for Yonezawa. The Linemar version has the Linemar logo. Duh. The white plastic on/off switch. Linemar's version has a larger, chrome, tin switch. 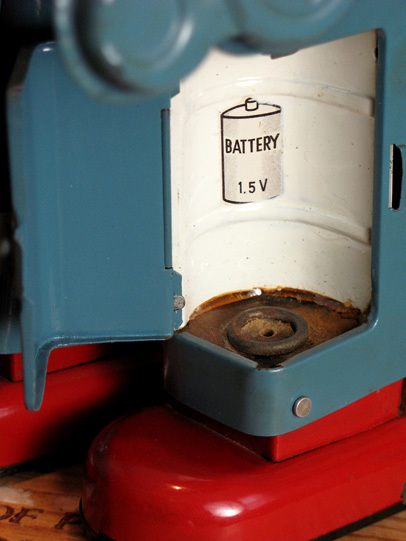 The battery box shows some mild corrosion. However, what looks like rust is in fact brown cardboard and old-school age-grime. 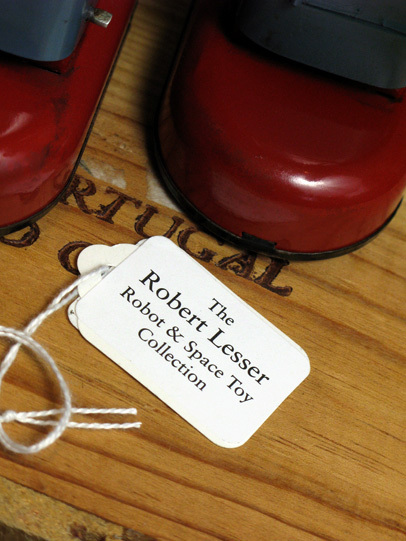 The tag from the Robert Lesser auction.